The Barrie-Collingwood railway (BCRY) is no more. This is the old shortline that runs from a mainline connection at Utopia outside of Barrie, Ontario to Collingwood where I live. It has only been handling a couple of cars a week, if that. The Canadian Mist plant was using it. The ethanol plant never did. A few car loads of agricultural products would go out of Stayner in the fall. I think they also received feed there. The other businesses along the line have all dried up. The Collingwood City Council decided in the summer of 2011 to cut their losses. It was shut down on July 14, 2011. The railroad had been jointly owned by Barrie and Collingwood and operated by a company from Calgary. A friend sent me the link to a video taken by Ian Chadwick of the last run that was posted on YouTube. There were a couple of HO models of this engine in the BCRY livery. 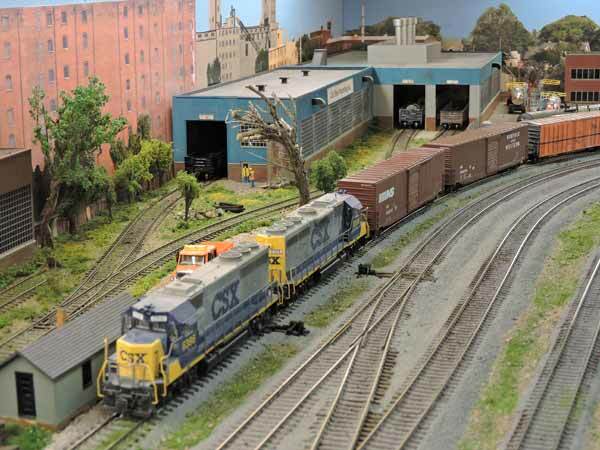 Dolf Roelofsen of our Nottawasaga Model Railway Club owns one. It's a great paint scheme. There's a sister locomotive in Orangeville that sports number 1000 if I remember correctly. Watch and weep! Our Nottawasaga Model Railway club is building a replica of the Barrie to Meaford CN line in the 1950s. Collingwood and its harbour will be the centrepiece. Return from "Collingwood-railway" to train videos. Return from "Collingwood-railway" to my Home Page.